Robyn Blumner opens as our U.S. President. You might have known things were going to be different when Center for Inquiry CEO Robyn Blumner in her opening remarks impersonated a certain president of the United States mocking the assembled skeptics for their “reality-based” view of the world and their love of facts, evidence, science, and reason. Good luck with that, said the confident U.S. leader, who in this case seems to know what he’s talking about. That disquieting theme resonated for a time throughout the conference, but it quickly got on to science with another of physicist Lawrence Krauss’s “isn’t science mind-boggling?” talks. This time he chose mysteries of the sun as his starting point. He soon got to the 1939 discovery of fusion as the sun’s energy source, then went on to the neutrinos that whiz unnoticed through our bodies, our homes, indeed our entire planet by the trillions every second, and then to the discovery that they can change forms en route. And that took him to deep mysteries of the universe, cosmic inflation, and dark matter and energy. Then the discovery just two weeks earlier of gravitational waves from the collision of two orbiting neutron stars. It led astronomers to turn their telescopes to that point in space and observe gamma rays, X-rays, radio waves, visible light, and other stuff from this gargantuan collision. And out of that discovery, already, has come the realization (or confirmation) that vast amounts of gold (perhaps one Earth mass worth) are created in each such event. Our precious metals originate in the collisions of orbiting neutron stars. “Isn’t it amazing!” he exclaimed. We could only agree. We were off to an exuberant start. “A festival of scientific skepticism” indeed, as I had predicted in my opening remarks following Blumner’s. CSICon Las Vegas 2017, the Committee for Skeptical Inquiry’s annual conference dedicated to science and skeptical inquiry, was underway. It proved to be the biggest and arguably the most successful yet (the fourth in the CSICon series and the second straight in Las Vegas). Five hundred sixty participants crowded the conference rooms, and, as far as I could see, most of them attended every session over the three days. Comments heard and volunteered were overwhelmingly positive. Many vowed to return. Next year’s conference will be moved to a bigger venue in Las Vegas (see the back cover of this issue for details). The three-plus days covered virtually every imaginable topic of concern to scientific skeptics—from the rise of institutionally based medical quackery to naturopathy (three talks, one by a former naturopath), to opposition to vaccines and genetically modified foods, to climate change denial, to why people are so resistant to knowledge, to conspiracy theories, to surviving in the post-truth world, to a small experimental examination of the question of whether God influences sports, and to people’s weird dislike of “chemicals,” even though everything, and everyone, is made of them. Physicist Taner Edis speaks on creationism, cranks, and conspiracy theories in the Islamic world, especially Turkey, before the large CSICon 2017 audience. Woody Kaplan asks a question, as host and emcee George Hrab looks on. Britt Marie Hermes on “The Bloody Work of Naturopaths.” Yes, that was her title. She was a naturopath herself, for three years. She got a degree as a naturopath doctor from Bastyr University. She really thought she was in medical school and that it was a real degree. She called herself Dr. Britt. She thought she got a good education at the time; she had been brainwashed she says now. She calls it “My complete and utter delusional thinking.” Nothing was as had been portrayed to her. “In reality, naturopathic schools teach pseudoscience.” She said there was some real science mixed in, “but the B.S. outweighed any real science.” What about the naturopathic medical board? “It exists to protect naturopathic doctors,” she said. Science Moms. That is the name of a group of women scientists who have organized to speak out for good science and against nonscientific thinking about vaccines, GMOs, and women’s health issues. It is also the title of a new documentary film about their efforts. 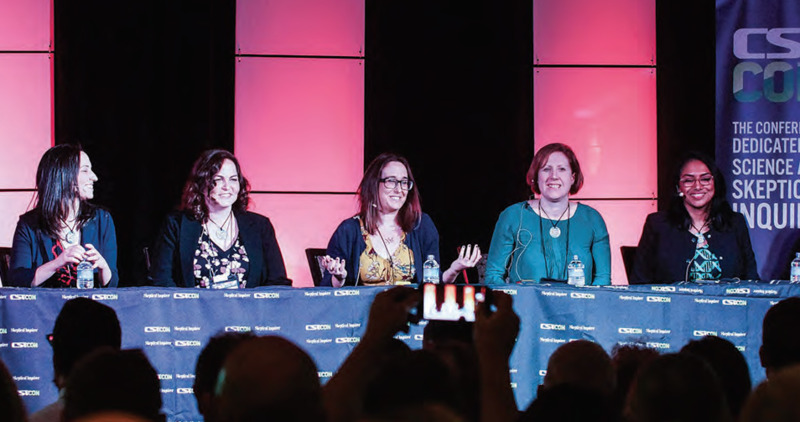 They all came to CSICon’s “Science Mom’s” panel and brought the film with them. We were the first audience to see it. You can now download it on the Internet, and it is worth your time. They also have a Science Moms Facebook page. The Science Moms are Kavin Senapathy, Alison Bernstein, Layla Katiraee, and Jenny Splitter. Natalie Newell, the film’s producer and director, was also on the panel. The Science Moms are courageous and outspoken. They get a lot of flack from people exposed to all the misinformation out there, and they counter it with real science. They are my new heroes of scientific skepticism. Moms are particularly vulnerable to pseudoscience that promotes fear and hype, and these women scientists are doing their best to counteract that. Marketers prey on the fact that being a parent is a bit scary, and they have found that promoting fear is an effective marketing ploy. Scaring parents works; they’ll spend big bucks trying to make sure their children are safe. “We wanted to provide a voice for moms based on science and evidence,” as one of them said. That they have done. The anti-GMO movement is one area where they are trying to provide better information. They point out that the vast majority of the foods we eat—with the exception of wild game, herbs, and mushrooms—have been genetically altered. There is a huge problem of vitamin A deficiency in the world, and genetic modifications can make rice enhanced in vitamin A. Yet anti-GMO ideology has tragically prevented vitamin A–enhanced rice from reaching the people who need it. Another marketing ploy is to pretend that organic foods are healthier. But the evidence shows no real health benefits to organic foods. They are just more expensive. The anti-vaccination movement is manipulated by similar strategies. Richard Dawkins and Richard Wiseman playfully spar in their on-stage interview. The Richard Dawkins-Richard Wiseman on-stage conversation. What a delight! These two well-known scientists brought their dry British wit to the stage, and it was almost as much fun watching their reactions to each other as listening to what they said. Psychologist Wiseman would get a mischievous look on his face, lean forward, and then hit his friend Dawkins the evolutionary biologist with a wry question out of left field. The still-rosy-cheeked Dawkins would hesitate for a moment. Then his eyes would twinkle, a little smile would break out, and he’d hit back with an equally unexpected answer. Wiseman playfully asked, “What is the least bad argument for God?” Dawkins and the audience laughed at that wording. “Fine-tuning,” he finally answered. He didn’t have to point out for this audience that in his books he has repeatedly and eloquently examined and rejected the fine-tuning argument. “We’ve seen a well-funded campaign to infiltrate science,” he said. Major efforts suggesting there are alternatives to science strengthened, and proponents lobbied governments to license quacks, changing the rules to suit themselves. Billions of dollars are now at work in the promotion of pseudoscience. Eugenie Scott on “Why Knowledge Resistance?” Eugenie Scott’s talk later in the conference complemented Novella’s in many ways. People are resistant to knowledge for a variety of reasons—but those reasons don’t include lack of intelligence or ignorance. If it were ignorance of scientific knowledge, we could fix it with education. Also, she doesn’t think it’s right to say Americans are increasingly anti-scientific. Polls still indicate that Americans are more likely to trust scientists than others. So there doesn’t appear to be a large anti-science tendency in America. Research indicates that ideology, values, and group identity are so strong that when people are presented factual information that goes against those elements, they believe even more strongly. This is the so-called “Backfire Effect.” It puts evidence-based proponents in a bit of a bind. Debates about opinions are healthy. But realize that our opinions are determined not only by facts but by values and ideology. Keep stressing that scientific facts are not opinion. Communications research tells us that to change minds we need not only the facts but better and more effective messages, repeated often. Have a strategy in our communications with others. Realize opponents aren’t stupid or ignorant. They are operating from a position of strongly held ideology, values, and group identity—as are we all. And that’s all from me. We’ll next give you some of Paul Fidalgo’s “live” short personal takes on CSICon talks. More still can be found on CFI’s website. Trigger warning: If you don’t like irreverent humor, stop reading now!